This dual coupled problem can easily be implemented in FEATool with the custom equation feature. This example solves the wave equation on a unit circle, with zero boundary conditions, constant c = 1, source term f = 0, and initial condition u(t=0) = 1 - ( x2 + y2 ). 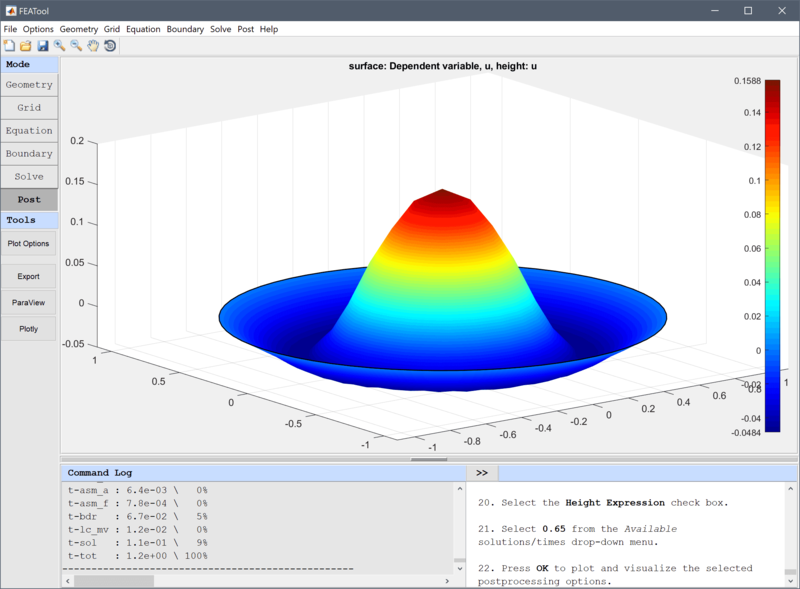 How to set up and solve the wave equation with the FEATool graphical user interface (GUI) is described in the following. Alternatively, this tutorial example can also be automatically run by selecting it from the File > Model Examples and Tutorials > Quickstart menu. 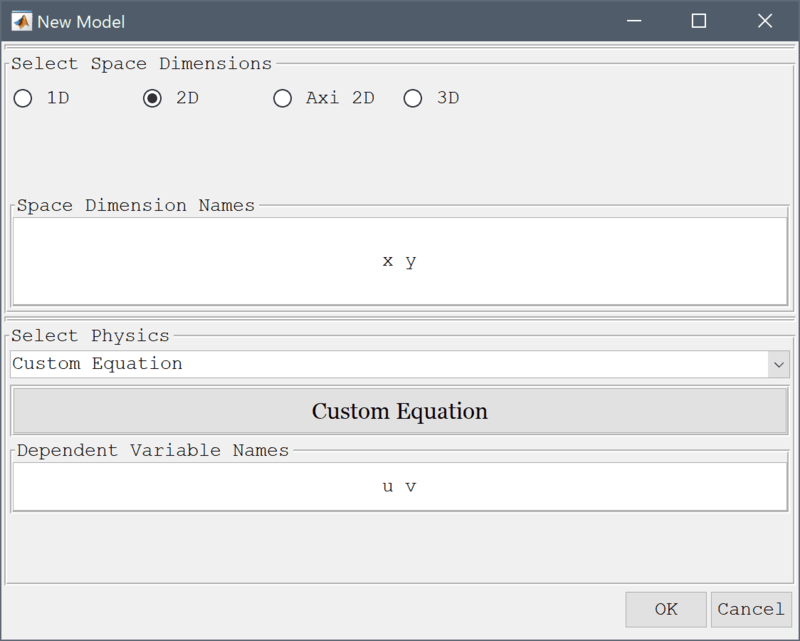 In the New Model dialog box, first click on the 2D radio button in the Select Space Dimensions section, and select Custom Equation from the Select Physics drop-down menu. Leave the space dimension names as x y, but change the dependent variable names to u v (the custom equation physics mode allows for entering an arbitrary number of dependent variables). This will add two equations for u and v, respectively. Finish and close the dialog box by clicking on the OK button. 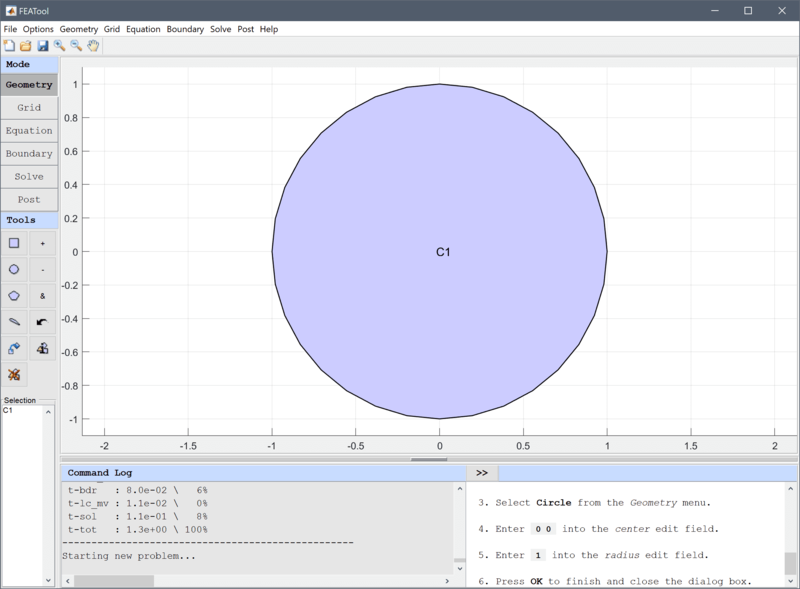 Create a unit circle with radius 1 centered at the origin (0, 0). 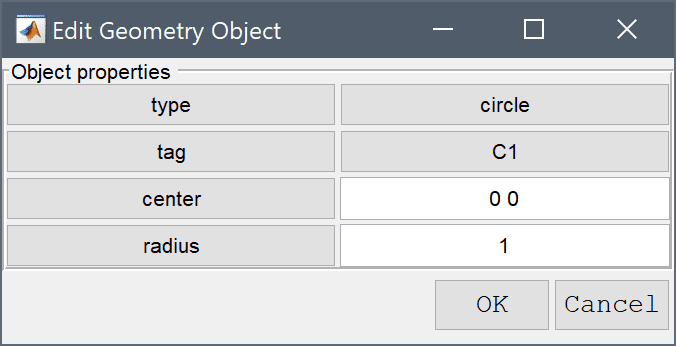 Select Circle from the Geometry menu. Enter 0 0 into the center edit field, and 1 into the radius edit field. The default grid may be too coarse ensure an accurate solution. 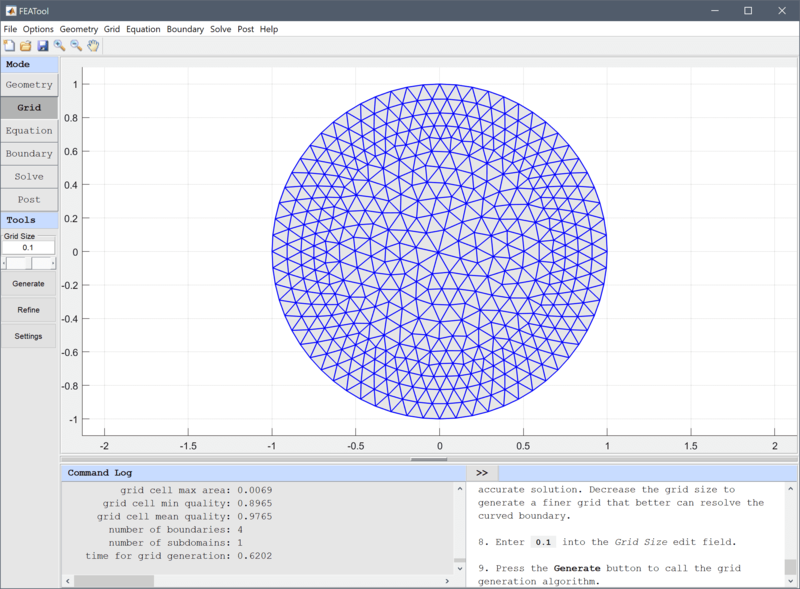 Decrease the grid size to generate a finer grid that better can resolve the curved boundary. Enter 0.1 into the Grid Size edit field, and press the Generate button to call the grid generation algorithm. Equation and material coefficients are specified in Equation/Subdomain mode. Set the initial condition u0 to 1-(x^2+y^2) and v0 to 0. Then click on the edit button to open the equation editing dialog box. In the Edit Equations dialog box enter the equations as u' - v_t = 0, and v' - c*(ux_x + uy_y) = 0 in the corresponding edit fields for u and v. Here u and v are the dependent variables, u'/v' denotes a corresponding time derivative, and an underscore will treat it implicitly in the weak finite element formulation (for example v_t corresponds to v multiplied with the test function for u, and ux_x is analogous to du/dx*dv_t/dx). Note, that the first equation could also be written as u' = v but then v would be evaluated explicitly in the right hand side, by transferring it to the implicit left hand side matrix gives a linear problem which is more efficient to solve. 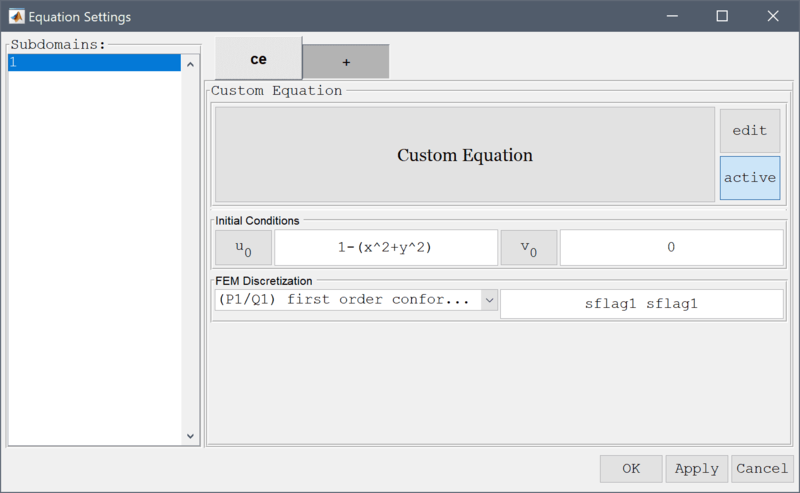 Click on the Constants Toolbar button and enter a new constant named c with value 1 (this is the constant used in diffusion term of the second v equation). Press OK to finish. 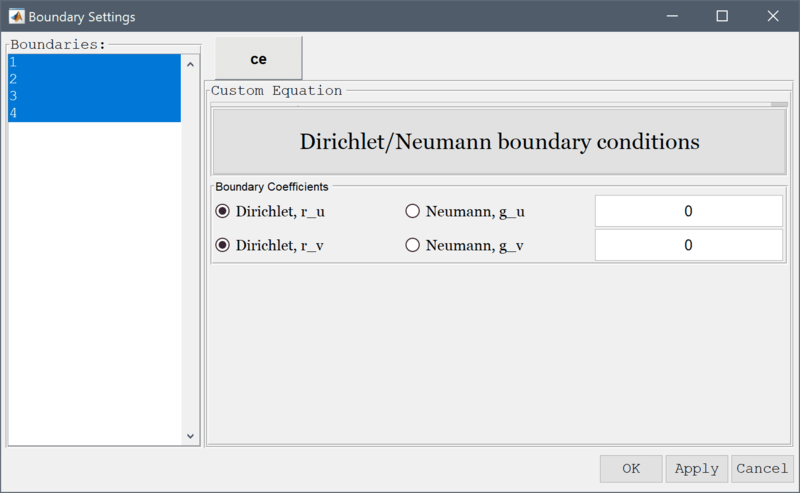 Press the Boundary Mode Toolbar button to change to boundary condition specification mode, and select Dirichlet conditions with prescribed value 0 for all boundaries. 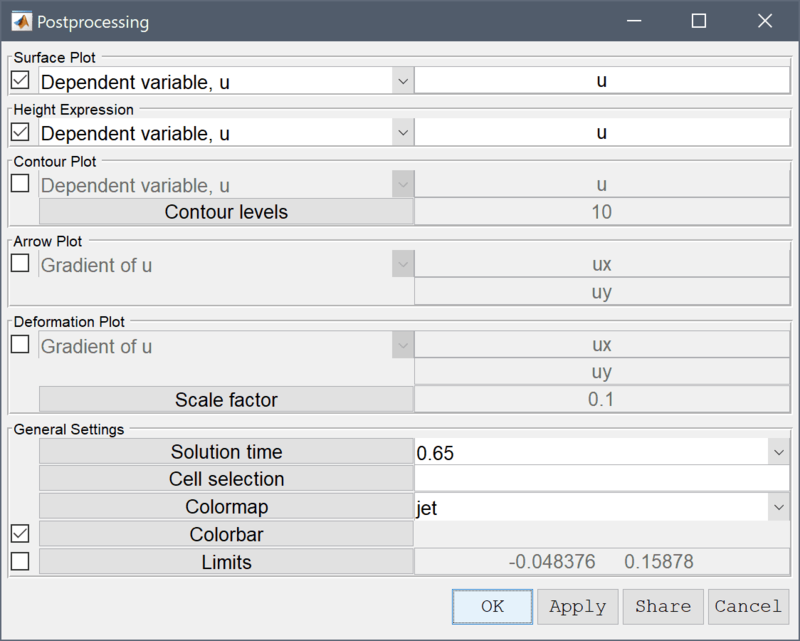 The solution at different time steps can visualized by selected in the corresponding solution times and visualization options in the postprocessing settings dialog box. Select the Height Expression check box. 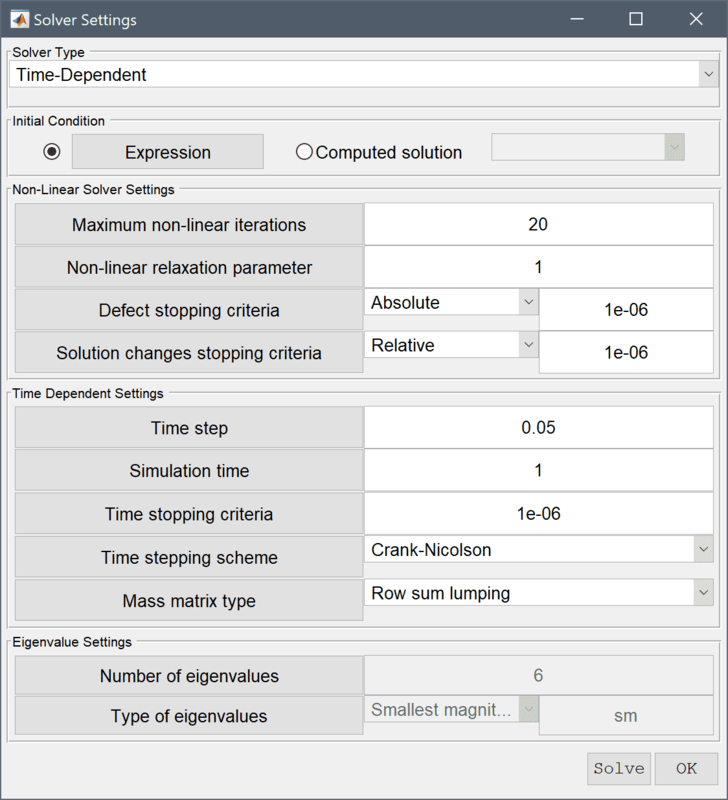 Select 0.65 from the Available solutions/times drop-down menu. 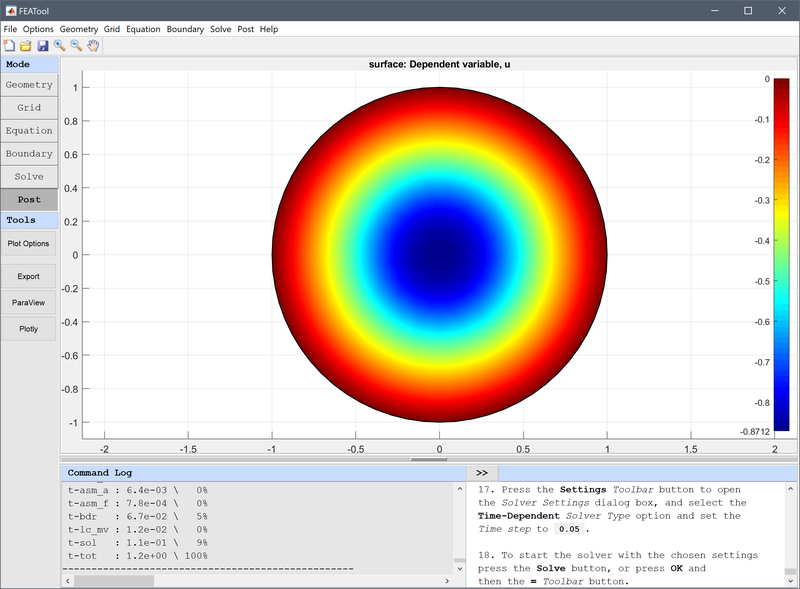 The wave equation on a circle classic pde model has now been completed and can be saved as a binary (.fea) model file, or exported as a programmable MATLAB m-script text file, or GUI script (.fes) file.